Abdullah Ibrahim on YouTube, visiting Mandela's cell on Robben Island and in and around Cape Town. District Six and Mannenberg. 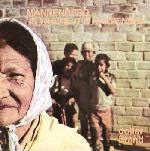 The composition Manneberg (Is Where Its Happening) was originally released in 1974 for Rashid Valli's As Shams label and became an instant hit forging a new fusion of South African and international styles and idioms. Later in the early eighties it became an unofficial anthem of the resistance to military rule. I was listening to Ekaya and I noticed that the actual length of each track is around 20 seconds longer than the one you posted. Just curious, since the rip is from an album, is your table spinning slower? Congrats for your video !